For those of you in the LA area, why not attend the first Xen User group meeting hosted by BitSource and Xen.og with Jeremy Fitzhardinge of the Xen community being the featured speaker. Information on the meeting is at http://www.meetup.com/Xen-User-Group-Los-Angeles. 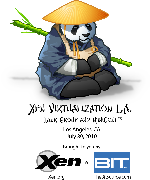 PS – Attendees will get the first Xen shirt with the Xen Panda so attendance has its privileges.